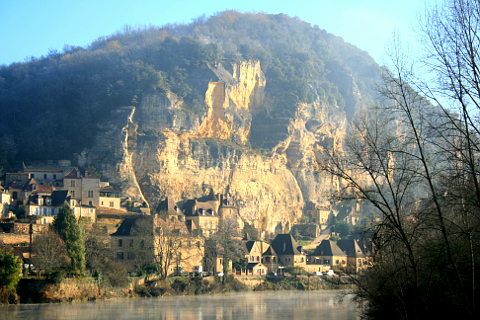 La Roque Gageac is one of France's most beautiful villages. 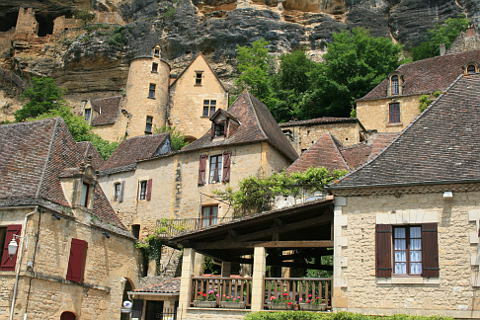 In a stunning position on the north bank of the Dordogne River, and backed by a steep hill / cliffs, with little to suggest that much has changed there in the last 300 years, La Roque-Gageac is truly the perfect picture postcard village. 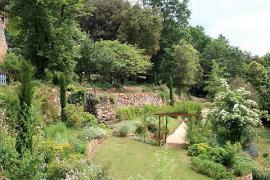 It is about 8km from the historic town of Sarlat. 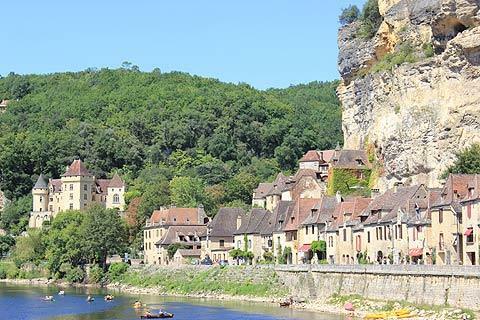 The golden yellow houses with their traditional perigord rooves, line the river and spread up the hill behind. While some of the properties in La Roque Gageac are quite modest, there is also an impressive number of grand houses among them. 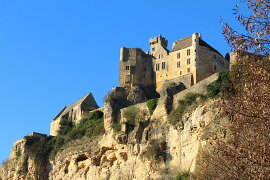 One of the grandest of these is near the road as you enter from Beynac - the 19th century (although it appears older) Chateau de la Malartrie built in Renaissance style. 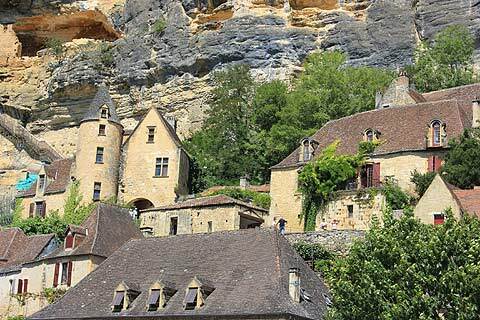 The troglodyte fort set in the cliffs 40 metres above La Roque Gageac is fascinating, and significant vestiges of the 12th century construction are still standing. 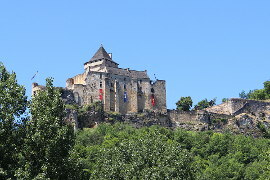 The strong defensive position of La Roque Gageac and the fortress whose defences continued to be elaborated up to the 17th century meant that it held an important strategic and defensive position in the area. 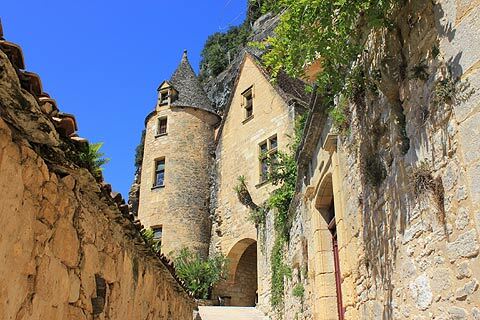 Just below the troglodyte fort is one of La Roque-Gageac's most impressive buildings - the Renaissance Manoir de Tarde with its round tower and mullion windows. 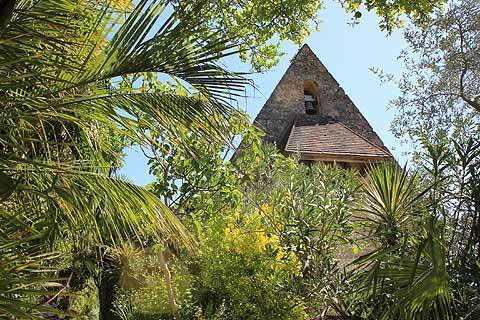 The whole village, but especially the bit near the church, is an interesting 'tropical style' exotic garden that you can wander through as you walk up the hill. The variety of plants is made possible because the cliff behind the village protects it from the cold weather from the north, while the open view to the south ensures it catches plenty of sunshine. 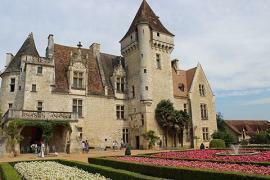 It was created by Gerard Dorin in 1970 and has flourished ever since. That's the good news. The bad news? It needs a car park bigger than the village to contain the tourists. 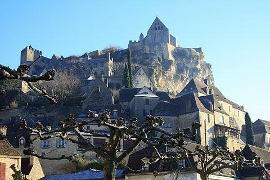 But that should not deter you from visiting because it really is a very beautiful village. 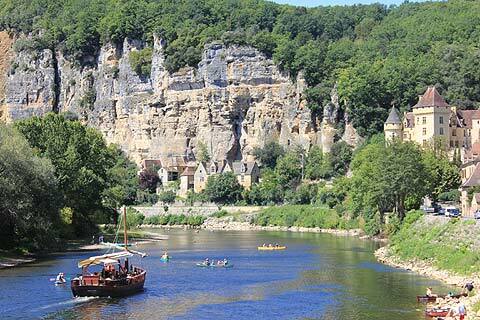 La Roque Gageac has always been an important trading point on the Dordogne river with goods being carried by traditional boats called 'gabares'. Replicas of these boats are now used for hour long river cruises. 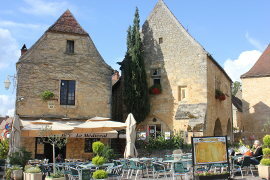 These start from various points along the river dordogne with those at La Roque Gageac sailing past the Chateau de la Malartie, the Chateau de Lacoste, the Chateau de Marqueyssac and the Chateau de Castelnaud. Each boat has a guide describing the sights, nature and history of the area but free audioguides in English are provided. 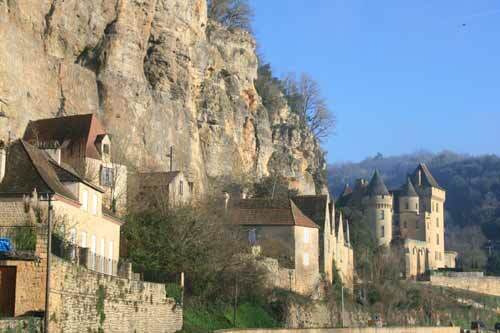 La Roque Gageac and the nearby Chateau de Beynac were key locations in the French film 'Camping 2' filmed in 2009. 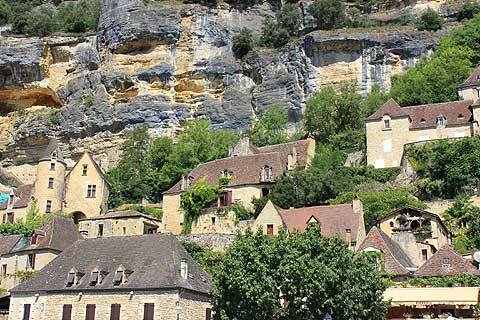 This is a hot spot for the most beautiful villages of France with Beynac just a few miles west and Domme just a few miles east. 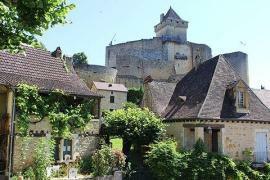 The magnificent Chateau de Castelnaud is on the other side of the river from La Roque-Gageac and on the same side just a couple of kilometers away is the imposing Chateau de Beynac. 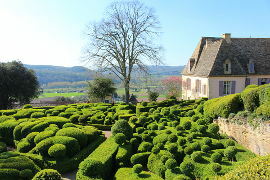 The Dordogne also has some wonderful gardens and the Gardens of Marqueyssac with their amazing swirling box hedges and the pretty Clos-des-Sources garden are both just a few kilometers from La Roque-Gageac.